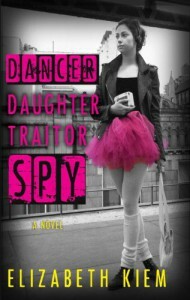 Dancer, Daughter, Traitor, Spy has many great elements. Intrigue, paranoia, deception and a little romance for balance. I'm not, however, sure that it will find its target audience in the young adult world.The story takes place in the 1980's, during the Cold War. I am barely old enough to remember much about the time period and I imagine some of the details at the beginning of the book may make for a less than interesting read for a younger audience. Beyond the Cold War aspect is the cultural aspect. While I find the Russian culture of that time very interesting, the first quarter of the book was really confusing.Once the story moves to Brooklyn, it is much easier to process the information and follow along. Though, the pacing was not at all what I would have liked. It meandered a bit too much at times and for an intrigue driven storyline...well, I would have expected a faster pace.That said, the story in itself, was intriguing. Marina has a great inner dialogue as she tries to navigate unfamiliar political waters and an entirely foreign culture. Being a teenager in the USA is difficult enough if you know the language, imagine being thrown into it and told to fly under the radar when you barely speak English. Add to it that she has to pretend to be someone she's not, something she's not.Her life is utter chaos and the more she tries to figure out what is happening around her and where her mother is, the more convoluted her life becomes.I can't say I loved this book. I can say that I made it to the end and that I enjoyed much of it. It was maybe a little too confusing at times, maybe a little too unbelievable at times but it was also a little interesting and had characters who were a little lovable if not always relatable.